B1. Does your community currently have any of the following policies in place? B2. Does your community have bicycle facility selection criteria that increases separation and protection of bicyclists based of levels of motor vehicle speed and volume? promote shorter distances between homes and destinations? Check all that apply. B4. Does your community currently have any of the following street design policies in place that promote a more comfortable cycling environment? Check all that apply. B5. Does your community currently have any of the following additional policies in place? Check all that apply. the most current AASHTO or NACTO standards? Check all that apply. B7. What policies or programs increase the amount of end-of-trip facilities for bicyclists? Check all that apply. community? Check all that apply. B9. Do your standards for bicycle parking: Check all that apply. Conform with APBP guidelines?, Address the need for parking spaces for cargo bicycles? B10. What percentage of public and private bike racks conform with APBP guidelines? development regulation) that provides or increases bike parking at any of the following locations? Check all that apply. B12. Does your community have a rail transit or bus system? B12a. Are bikes allowed inside transit vehicles, including buses? Check all that apply. B12b. What percentage of buses are equipped with bike racks? major transit stops to improve accessibility? Please describe any bicycle infrastructure investments around major transit stops that have improved accessibility. Installation of over 75 bicycle parking spaces at the town center MacMillan Pier bus stop. transportation? Check all that apply. B13. Are there any off-street facilities within your community’s boundaries that can be legally used by bicyclists? B13b. Which of the following features are provided for bicyclists and pedestrians at off-street path crossings of roads with posted speed limits above 25 mph? Check all that apply. bicyclists on off-street paths? Check all that apply. B14. What is the centerline mileage of your total road network (including federal, state,county and private roads)? B16. Does your community have on-street bicycle facilities? B16a. Are there any on-street bicycle facilities on roads with posted speeds of ≤ 25mph? Answer in centerline miles. Write “0” if facility is not present in community. B16b. Are there any on-street bicycle facilities on roads with posted speeds of >25mph and ≤35mph? B16c. Are there any on-street bicycle facilities on roads with posted speeds of >35mph? B18. How has your community calmed traffic? Check all that apply. for on-street bicyclists? Check all that apply. B20. Are there any signalized intersections in your community? B20a. Which of the following accommodations are available at signalized intersections to improve conditions for bicyclists? is open to the general public? B21m. Please provide a link to your bike sharing program website. B21n. What is the name of your city’s bike share program? This is a private dockless bike share operated by VBikes, not a municipal program. B21o. Who is involved in implementation of this program? B21p. What type of system will your bike sharing program be? B21q. How many bikes will be in the system? B21r. How many stations will be in the system? B21s. Will there be options for transporting children as passengers? B21t. What specific efforts, if any, are being planned to make the bike sharing program accessible to low-income populations your community? Check all that apply. B24. 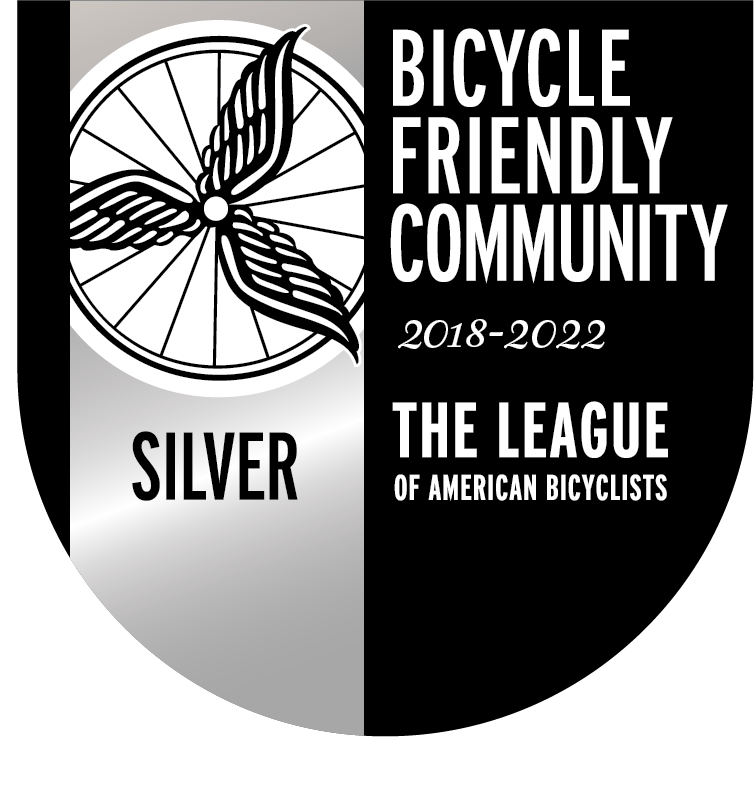 Describe any other policies, amenities, infrastructure improvements or maintenance programs that your community provides or requires that create a comfortable and attractive bicycling environment for bicyclists of all ages and abilities. placement of new public drinking water fountains.